That's a European Swallow without coconut, obviously. Our Monty Python Shirts primarily deal with the ultimate comedy film Monty Python and the Holy Grail because being the geeks that we are, it in itself IS the Holy Grail of laughter. Being such fans of Monty Python, we set out to answer the age old question of how fast a swallow could fly if it wasn't emburdened with a coconut. 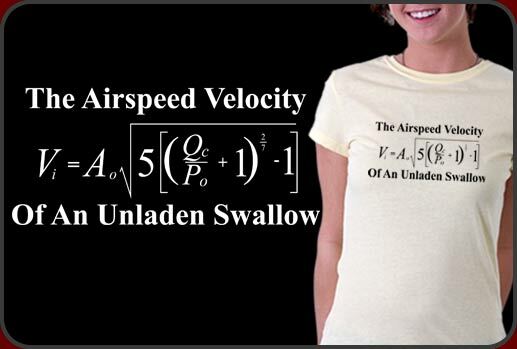 In one of our favorite Monty Python Shirts ever, we have revealed the equation to the world. We would like to share this information to the populace for free but unfortunately you must purchase a Monty Python shirt in order to contain it's knowledge. We have tons of great mercahndise featuring our Monty Python Shirts design from t-shirts, sweatshirts to coffee mugs and buttons.